Oh, this is wonderful. It is the perfect book for very young children. The robins have such love in their eyes for one another as they begin their life together. And on the next two pages, the daddy robin looks out for any danger, while his mate sits on the nest, looking perfectly contented. The book goes on in this way with one word, and a picture that spills over both pages. Life continues for the little family through the summer and autumn and winter. It is not without danger, in the forms of a cat and an owl, but with those vigilant parents watching over their baby, the reader knows no harm will be done. There is no better message for a young toddler than to know he or she is completely loved and utterly safe. When spring comes again it is the end of the book, and a new beginning for the young robin, and so the circle of life goes on. Nest is a little masterpiece for the very young. I've given Hazel Nina a copy, and have one for Campbell Walker when he comes into the world. Margaret and Matthew gave us a wonderful present in honor of Hazel Nina's first Easter. March was a very different reading month from January and February. I started and quit several books. I ended up reading two books, one of which I really loved. 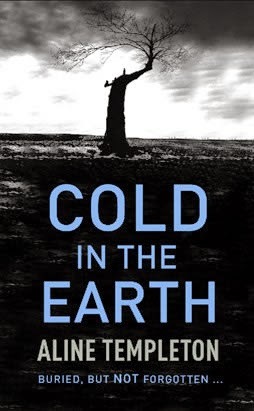 I decided to give Cold in the Earth a try after reading about it here. It had the oddest plot I’ve ever read in a mystery. I don’t want to say what it was because it would give too much away, but it featured a very weird psychological disorder. The book is set during the hoof and mouth disease days of 2001. We had planned to go to England that summer, but decided against it because we had farm animals, and also because we got our milk from a local farm, and just didn’t want to take any chances. The book shows the devastation to animals and to people. So very sad. I tried the second in the series, but found I wasn’t interested enough in the characters to continue on. I can see how the series would be very appealing to many readers - I’m thinking particularly of those who like the Ruth Galloway series by Elly Griffiths. Neither one is for me, though they are both very good. Just not my taste. The second book by Katharine D’Souza was as wonderful as her first, Park Life which I wrote about last month. It is again set in Birmingham, England but is a very different story. This time we meet Caroline, a young woman who has come home to Birmingham from London after her marriage broke up. She works as a museum curator at the Birmingham Museum and Art Gallery. From the outside this seems like a pretty sweet job, but Caroline is understandably not feeling so good about herself after the divorce, and the move back to her childhood city. She wonders if she has always taken the easy path, and hasn't pushed herself enough. Coming home brings her back into the day-to-day life of her family. 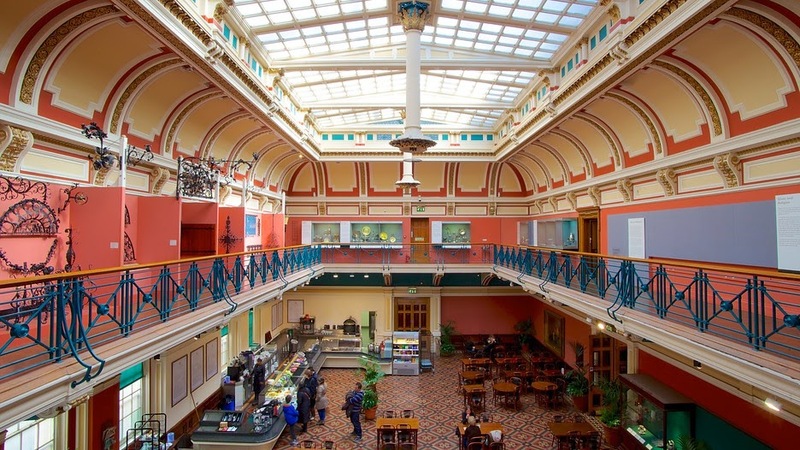 The quality of the museum and the familiar, vibrant city had tempted her back to Birmingham, and she'd ignored the inner voice mumbling that it wasn't really a challenge, hardly even a change. Less enticing was that the move brought her back to the same city as her family. They weren't dreadful, just demanding. Then her grandmother Beth has a fall and ends up in the hospital. She had been 'trying to get a box from the top of her wardrobe and fell from the stool.' This event becomes the catalyst for the whole story. Caroline stumbles upon a family mystery when she picks up the box. A man from Caroline's past comes back into her life. She meets a relative she didn't know existed. All these things combine to bring her into a new future. The Suffragette movement in Birmingham becomes the focus of Caroline's study as she tries to sort out her family history. While Caroline gets strength and resolve from the suffragists struggles, I was pleased to see that Beth's quieter life which centered around her home and family was also meaningful to the young woman. It is rare in modern life, and literature, that women at home get such appreciation. There are some really beautiful descriptions of her grandmother's house which fans of Rosamunde Pilcher will love. She thought again of Beth's home and how items to occupy her hands or mind were placed by each chair: a bag spilling knitting needles and bright skeins of wool by the armchair in the living room, a newspaper folded open to the crossword on the dining table, books on the coffee table or bedside cabinet. It featured dark wood panelling, beautiful floral patterned tiles, alluring inglenook fireplaces and many rooms with dual aspects through leaded windows containing stained glass insets. As she flicked through the floral wallpaper-covered exercise book Beth used to copy down favourite recipes Caroline's eyes filled with tears. With the tip of her index finger she traced the familiar handwriting on each page, almost hearing Beth's own voice speak each word. The grease-spotted paper was evidence of how well used the book had been and each page sparked memories of meals in that kitchen throughout her life. I feel so very fortunate to have discovered Katharine D'Souza from heavenali's blog. 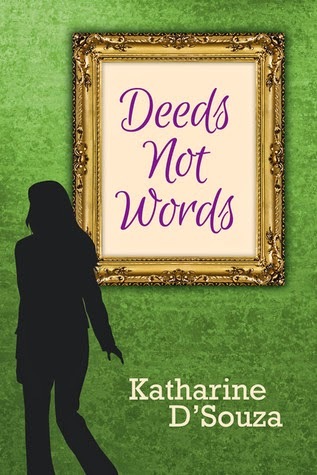 Please do read her excellent, detailed review of Deeds Not Words here. The author has put together a great Pinterest page with postcards depicting scenes from the book. 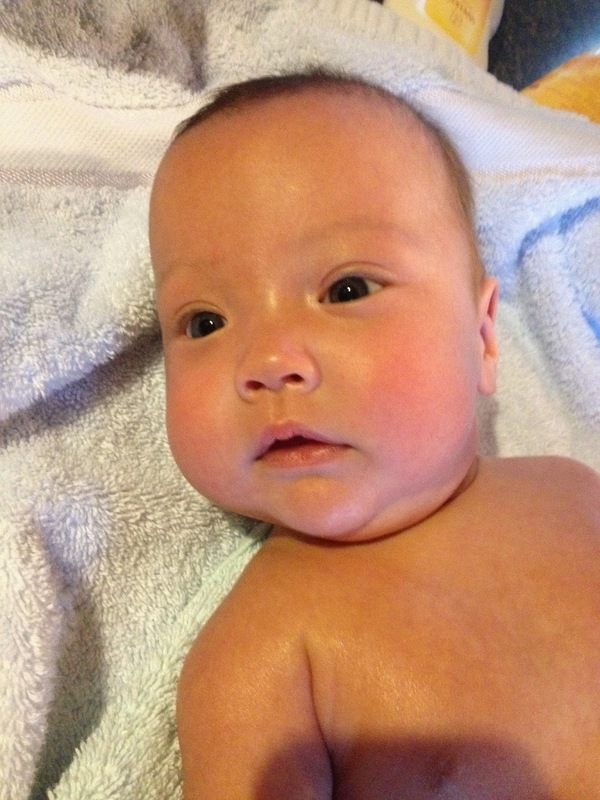 This was taken on April 11, the day that Hazel Nina's weight was in the double digits for the first time! 10 pounds, almost 5 times what she weighed on the day she was born. A miracle, a miracle. 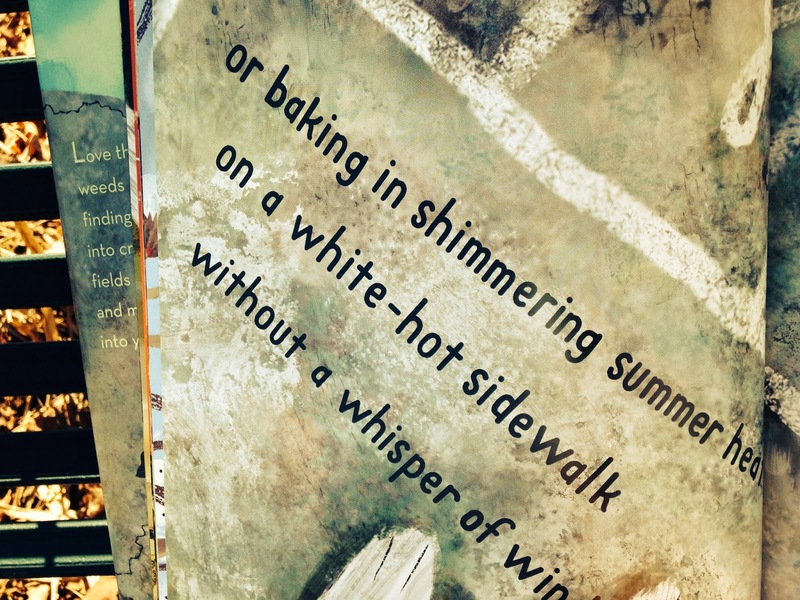 If asked what is my favorite kind of fiction the answer would be a book that shows the healing powers of place, particularly the natural world, and Miracles on Maple Hill certainly does this. Ten-year-old Marly’s father has post-traumatic stress disorder- before it had a name- in the years after the Second World War. He jumps at the slightest noise, he strikes out verbally at his family, isn’t able to work, and is constantly tired. His wife has an idea for the whole family to travel from their home in Pittsburg to a rural area of Pennsylvania, where she used to spend summers with her grandmother. Marly has always been smitten with the stories her mother told her of those days, and she feels that it will be just what her father needs. The plan is that he will stay on after their visit and fix the place up, while they come weekends, and then stay the whole summer. As you will probably guess, working on the house, gardening, and sugaring help the man find peace and joy in living again. He brings her out to the woods when the spring flowers come along. I learned about a plant I have in my own yard that I’ve written about in my letters, bloodroot. All over the ground around her were great green leaves, each with a cleft in the side. Up through each cleft came a long thin stem, and on top of each stem stood a pointed bud exactly like a candle flame. It had a scarlet root, as bright as blood. … it’s absolutely true that if anybody eats it, his heart will stop in a day. He goes on to tell her about hepaticas. Marly’s mother remembers “Grandma saying you couldn’t bring things out of the ground until they were ready.” But Marly learns from Mr. Chris that you can ‘help’ them come along by pulling off the leaf covering. The flowers had to push their stems up through layers and layers of old brown leaves, and sometimes one of the leaves was extra tough and wouldn’t move off, so the poor flowers were stuck together and coudn’t open. The minute Marly broke off the tight old leaves, the flowers opened right away. … Mr. Chris made her feel as if every flower was a particular old friend. It was grand to see his face when he noticed something for the first time that year. Marly has a brother two years older, and the book shows the 1950s idea that boys were the adventurers and girls were scared of the unknown. He goes off on his own, and she feels badly. Mr. Chris opens up a world that becomes rather hers alone, a separate one from her brother’s, which builds her self-esteem. And he comes to admire her, as well. As summer draws to a close, Marly is filled with regret that she won’t see the fall, which may just be the most beautiful time of year on Maple Hill. There are decisions to be made, and each family member has a voice in them. Young readers will wonder what will happen, and worry when Mr. Chris gets sick. They will be interested in a 'hermit' who lives nearby. So, the book is a beautiful mix of information and appealing story. Miracles on Maple Hill received the Newbury Medal in 1957. 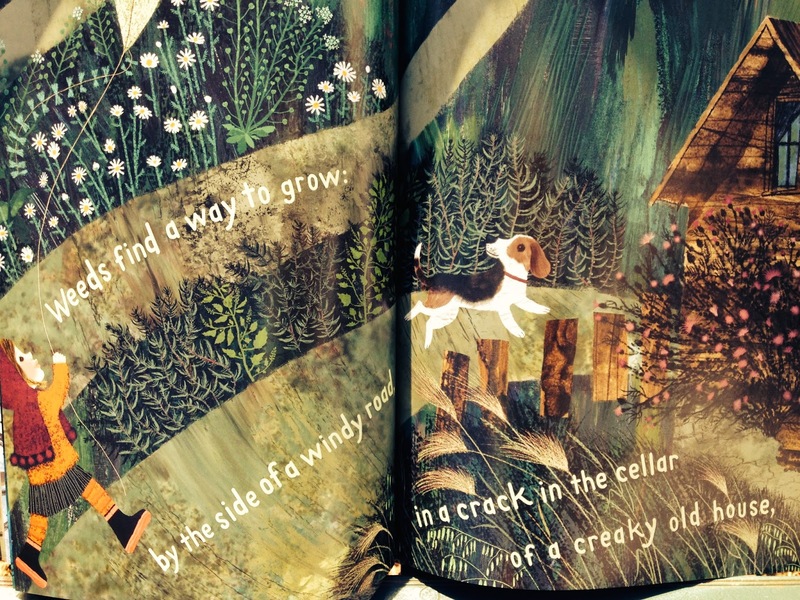 It is a wonderful book that doesn’t speak down to children and makes them feel included in the written conversations. I’ve read this a couple times over the years, and love it more with each reading. And I’ve now bought copies to share with my grandchildren as they get older. 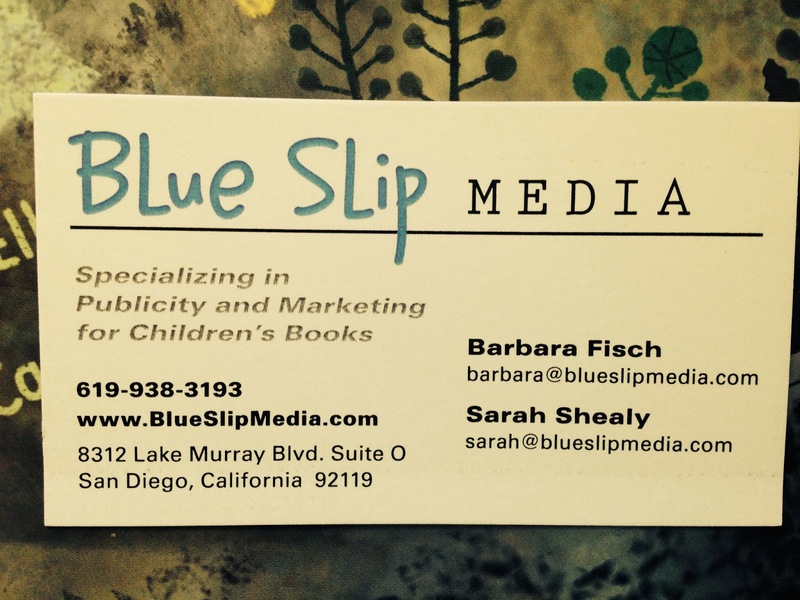 This is the fourth children's book I've been sent by Blue Slip Media. The others were Arbor Day Square, Planting the Wild Garden, and Miss Lady Bird's Wildflowers. I loved each one, as I do Weeds Find a Way. What the books have in common is teaching little ones about the natural world. Their website is here and their Facebook page here. and goes on to explain how the weed seeds travel. This is a subject that even we adults may not think about too often. 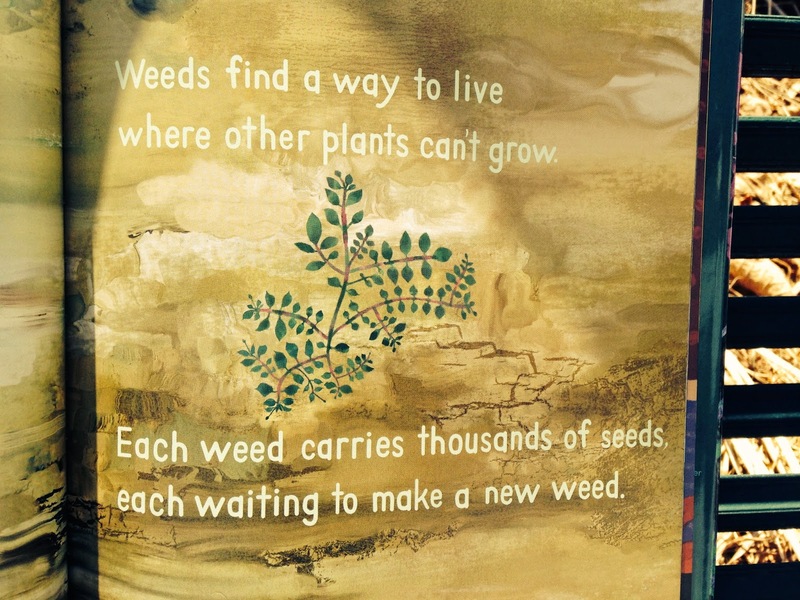 We may gripe about weeds, without realizing how they spread. Perhaps reading this book to the children in our lives will give us a new appreciation for these quite wonderful plants. There is a lot of press now about how crucial milk weed is to the life-cycle of the monarch butterfly, and who knows what important part other weeds might play in the world. If conditions for growth aren't ideal, weeds will wait. 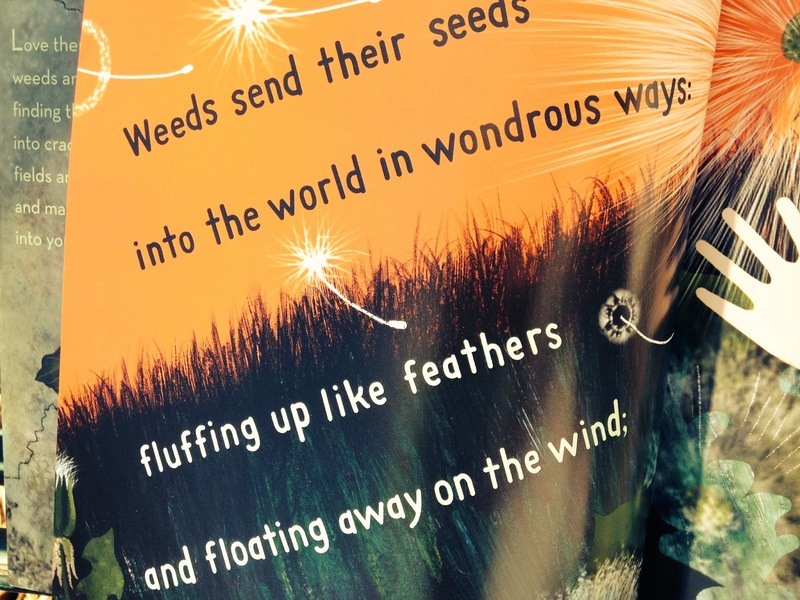 And after their waiting period is over, the book tells about the many unexpected places a weed might settle in to grow. 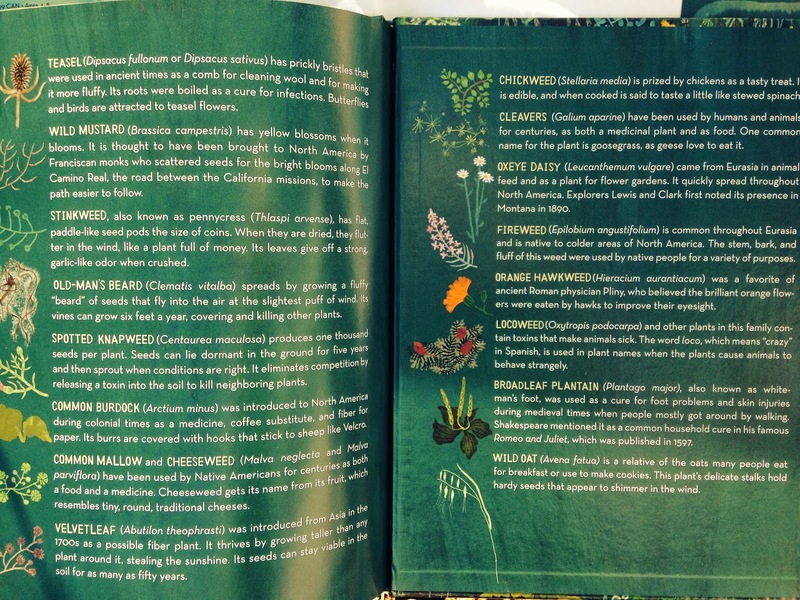 At the end, there are two pages telling the reader about many weeds, with such fun names as teasel and cheeseweed. This book is a gem, for children and for the adults who read to them. I learned a lot. It's a book to carry outdoors, while going on a search for weeds. 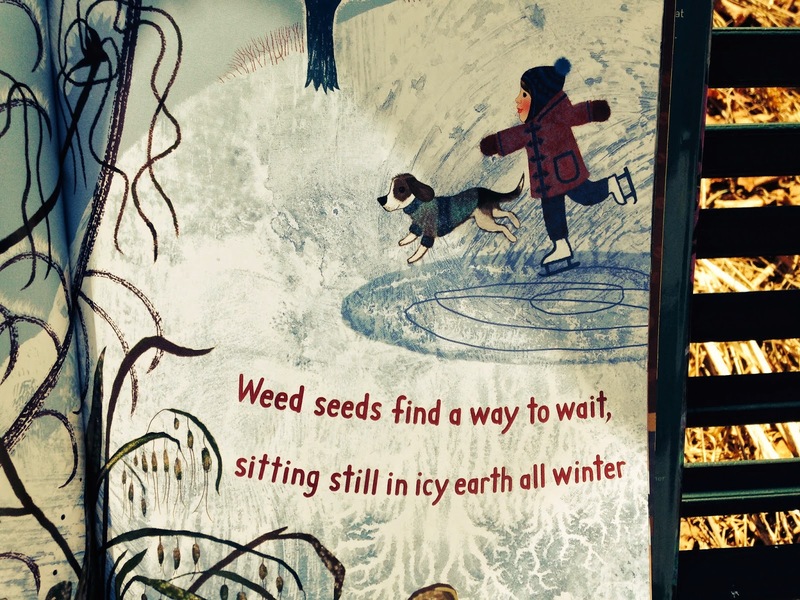 It is wonderful for country children and city children alike, because weeds do grow everywhere. Today while Hazel Nina was asleep in my lap, Margaret read the book aloud. It was a delightful experience. We'll read it to her over and over as she gets bigger, and to her soon-to-be-born cousin, Campbell Walker. I'm sure they will both love it. I didn't think to have Tom take a picture of the reading, but here is the darling girl just afterwards, all set to go home. As I mentioned on the April post of afternoon gardens, the grammy, the daughter, and the granddaughter had a lovely shopping day. We went to two stores which we've visited many times since Margaret was little. First we went to our local health food store, where the owner, our friend, has been following Hazel’s progress on Facebook, and was eager to meet the little lady. We had a wonderful visit. 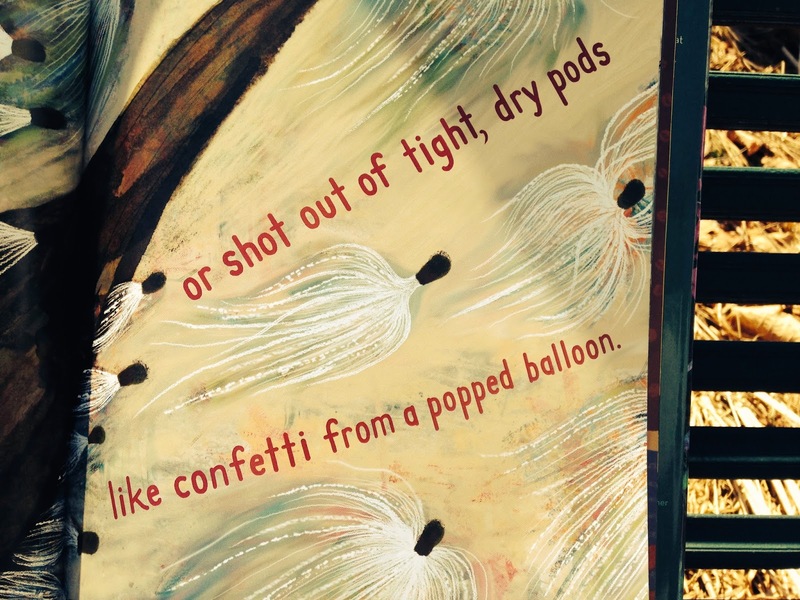 I took some pictures and posted them on Facebook with the words, ‘third generation shopper.’ The occasion filled me with a new and exquisite joy - the pleasure of sharing my daughter’s childhood with her daughter. We then proceeded down the hill for a bittersweet visit to our independent bookstore. Bittersweet because it is closing, and that very day was its last day in business. This store has been such a part of our lives. Forty years ago, Tom and I would haunt the aisles on a late-opening Friday night. By the time our kids came along, the store had moved to a bigger location, and also sold the most wonderful children’s books and toys. There was a toy creature that rode a unicycle on wire suspended from the ceiling, propelled by batteries or magic. There was a wooden train set up on a table at just the right height for little ones to play with while their parents were shopping. There were stuffed animals and games and tapes and just about anything you could imagine. The downstairs was given over to children, while the books for grownups were upstairs on the main floor. It was bright and cheery and welcoming. The clerks were knowledgeable readers, and there was a whole shelf devoted to employee recommendations. It was the ‘anchor’ store for Main Street, and such a part of the community. There were yearly contests in the schools where children would draw bookmarks, and the winning designs made into official bookmarks which were tucked into books bought at the store. Some years ago, the original owner sold it, and gradually many of the older staff left. We got to know the new people, but the feeling wasn’t quite the same. And then of course the changes that were felt all through the book world began to happen. Internet shopping and electronic books began to gnaw away at the store’s business, and then the recession compounded the situation. I am as guilty as the next person. It was very hard for me to go there and spend $25 for one book when I could buy two online for just a little more. I’d still go in at Christmas time and buy presents but I winced at the price. They tried some new things to bring people in: a little cafe, some author appearances, a book club, and various classes. Finally the two floors were combined into one to cut costs. But in the end none of these things could save the store. And so, it is now closed, and Hazel Nina will never know it as her mother and I did. Our third stop was to a delightful shop that a woman keeps in the front rooms of her house. It is packed with everything delightful, from jewelry to notecards, and candles to baby shoes. It is like an old-fashioned, much-loved living room. The woman is also a friend who has been keeping up with Hazel Nina on Facebook, and was overjoyed to see her in person. Everywhere we went kind people flocked around, some we knew and others we didn’t. After hearing Hazel’s story, one man in his seventies said that when his sister was born, a wedding ring could be slid up her arm. It was a day that filled our hearts with love and friendship, and a sense of belonging. Temps in the 50s, sunshine, melting snow, shopping with Margaret and Hazel - who could ask for a better day!